You can stock your kitchen with every type of modern slicer, dicer, and immersion circulator you want, but the piece of cooking equipment that comes most highly recommended by chefs has been around for centuries: the cast-iron skillet. Like the name suggests, this essential cooking tool is molded from molten iron and coated with a protective seasoning. The result is a durable, versatile piece of cookware that’s perfect for making everything from dump cakes to sunny-side up eggs. So what is it exactly about cast-iron that entitles it to a spot on your stovetop? Here are some points to consider. Iron is prized by engineers for its high-tensile strength, so you can bet it will hold up to whatever you throw at in the kitchen. But the metal does have one crucial weakness home cooks need to be aware of: water. Iron combines easily with oxygen, which is how you get iron oxide or rust. When iron is exposed to water, that liquid mixes with gases in the air to create a weak carbonic acid. The acid corrodes the iron, and the oxygen in the water bonds with the newly dissolved iron and forms iron oxide. While it won’t necessarily poison you, rust isn’t something you want flavoring your dinner. Fortunately, keeping your skillet rust-free is easy to do. All cast-iron pans need to be seasoned before they’re ready to hit the stove. To season a pan, you can coat it with a thin layer of neutral fat like vegetable oil and heat in the oven. During the frontier days, DIY seasoning was the only option for cast-iron owners, but today most pans come pre-seasoned. But even well-seasoned cast-iron benefits from a little extra care from time to time. Before re-seasoning a skillet, DeVito suggests wiping it clean of any grease or caked-on food that’s left over from whatever you cooked last. Instead of scrubbing it with a soapy sponge, she washes her pan with hot water and a brush. Tough plastic works well for this, as well as chain-link metal that you can use like a hand towel to wipe down the pan. After she cleans it, DeVito likes to dry her cast-iron by placing it over low heat on her gas stovetop for a few minutes. Once it’s dry, she rubs it with a quarter teaspoon of vegetable oil using a paper towel, lets it sit over low heat for a few minutes more, and then wipes off the excess oil with another dry paper towel. While it may not fit into your regular dishwashing routine, treating cast-iron cookware correctly pays off. A well-maintained pan is tough enough to withstand super high heat, meaning you can start cooking a dish on the stove and finish it in the oven in the same pan. The iron itself will endure any type of utensil you use on it, whether it’s a wooden spoon, metal tongs, or a plastic spatula. And if you ever damage the skillet’s seasoning or allow it to rust, it can be restored without too much trouble. “Ideally, you should be able to hand it down to your kids,” DeVito says. Cast-iron offers health benefits beyond the nutritional value of the food it cooks. The first is a healthy dose of iron added to your meals. If you have an iron deficiency, like close to 10 million people in the U.S. do, your doctor may recommend incorporating more meat, beans, and leafy greens into your diet. In addition to eating iron-rich foods, you could also try preparing more meals in a cast-iron skillet. As the metal heats up, small amounts of iron leach out and enrich your food. The is especially apparent with acidic, higher-moisture ingredients like applesauce and tomato sauce. The iron you get is definitely not enough to replace dietary iron, but it’s a nice bonus if you’re looking for more ways to sneak the nutrient into your meals. With cast-iron, you know the only thing being added to your food is an essential mineral. Nonstick Teflon pans, on the other hand, are made from substances that aren’t safe to be eaten. (Though you don’t really need to worry about these chemicals contaminating your food unless you’re really abusing the pan.) If your cast-iron is seasoned well enough, it will produce the same nonstick effects as Teflon without the unwanted chemicals. And that brings us to the final health benefit: Cooking with cast-iron requires less oil than conventional pans. Because oil is already baked into the cast-iron’s exterior, you don’t have to worry about meat and vegetables getting stuck to the surface. You can either add a small amount of oil or no oil at all so you don’t end up adding more fat to your dinner than necessary. Even without the industrial strength and bonus minerals, the cast-iron skillet would still be prized by cooks for the incredible effects it has on food. This is because of the way it reacts to heat. Iron is much thicker and denser than materials like copper and aluminum, so it takes longer to heat up. But once the metal has been heated through, it packs a lot more thermal energy than most metals heated to the same temperature. All that harnessed energy is the key to achieving crisp, golden-brown sears on foods like steak, hamburger patties, eggplant, and scallops. And just as cast-iron takes a while to get hot, it’s also slow cooling down. That means that once you’ve left your pan to sit over a raging burner or in a screaming-hot oven for long enough, you can trust it to maintain that heat, even after filling it with cold or room-temperature ingredients. The cooling effects food has on other metals is one of the most common culprits that leaves foods pale and flabby rather than brown and crunchy. 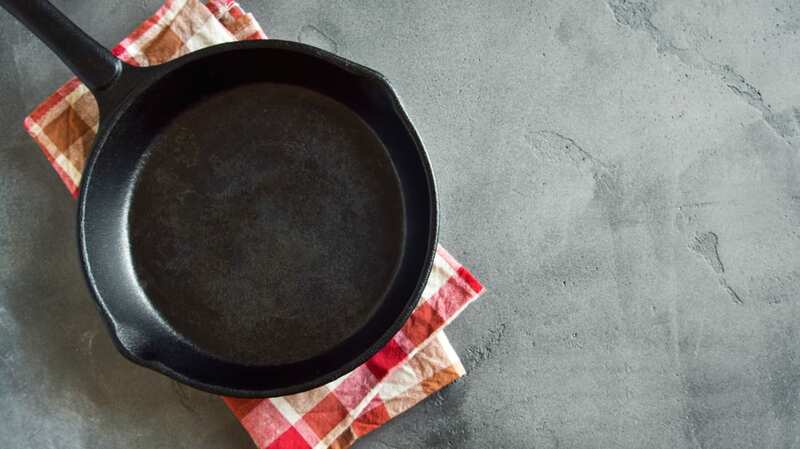 With so many desirable qualities, you may expect a cast-iron pan to rank up there with other rite-of-passage kitchen items in terms of price. But it's actually easy to find a cast-iron pan for less than other pans that don’t perform as well or last as long. Lodge, the brand DeVito recommends, has 10-inch skillets available for around $25 on Amazon. You can find fancier cast-iron pans from brands like Le Creuset selling for over $150, but when it comes to this kitchen essential, simplicity is hard to beat.